Source Optimized DNA sequence encoding Mouse Stromal Cell-Derived Factor-1 beta mature chain was expressed in Escherichia Coli. Molecular weight NativeMouse SDF-1 beta, generated by the proteolytic removal of the signal peptide and propeptide,the molecule has a calculated molecular mass of approximately kDa. Recombinant Mouse SDF-1 beta is a disulfide-linked monomer protein consisting of73 amino acid residue subunits, migrates as an approximately kDa protein under non-reducing and reducing conditions in SDS-PAGE. Biological Activity Determined by its ability to chemoattract human peripheral T cells activated with PHA and IL-2 using a concentration range of-40 ng/ml. Presentation Mouse SDF-1 beta was lyophilized from a.2 μm filtered solution in.5% glycine,.5% sucrose,.01% Tween80, mM Glutamic acid, pH.5. Chemotaxis experiments were performed in polycarbonate transwell inserts (8 µm pore .). SDF-1α was added in the lower chamber at the concentration of 100 ng/ml. Cells were seeded at a density of 1.5×105 per well in the upper compartment and were cultured at 37°C for 14 h. Non-migrating Cells were removed from the upper surface by gentle scrubbing. Migrating cells attached to the lower membrane stained with 0.1% crystal violet and were counted in five random fields. Total thymocytes were resuspended at 1×107 cells/mL in DMEM with 0.1% BSA. Cells were pre-treated or not with 20 µM of the PI3K inhibitor, LY294002, for 30 min at 37°C. Cells were stimulated with 10 nM SDF-1α for various time points, immediately fixed in 1X Phosflow Lyse/Fix Buffer and washed once with FACS buffer. Thymocytes were then permeabilized in 90% methanol on ice for a minimum of 30 min and washed twice in FACS buffer. AKT activation was detected with anti-pAKT (1/100) followed by incubation with an Alexa fluor 647 conjugated anti-rabbit secondary Ab. ERK activation was detected with anti-pERK (1/400) followed by incubation with biotin conjugated anti-mouse Ab and APC conjugated streptavidin. Cells were also stained with Abs to surface markers and analyzed by flow cytometry. ERK/AKT phosphorylation was quantified as fold induction of mean fluorescent intensities of stimulated samples/unstimulated samples. The bottom chambers of 24-well transwell plates (8 µm pore polycarbonate membrane transwell, ) contained 600 µl of each assaying condition in complete media (RPMI +10% FBS, for THP-1 cells) or minimal media (DMEM for RAW264.7 cells). For THP-1 cells the bottom chambers of the transwells containing RPMI media were untreated or contained PKRA7 (1 µg/ml), MCP-1 (100 ng/ml), MCP-1+ PKRA7, PK2 (200 ng/ml), or PK2+ PKRA7 in triplicate per condition. For RAW264.7 cells the bottom chambers of the transwells containing DMEM media were untreated or contained PKRA7 (1 µg/ml), SDF-1α (200 ng/ml), SDF-1α+PKRA7, (200 ng/ml), or + PKRA7 in triplicate per condition. MCP-1, SDF-1α and PK2 all dissolved in water plus 0.1% BSA (water +0.1% BSA used as control). The appropriate number of cells was collected in complete (THP-1) or minimal media (RAW264.7) and 100 µl were plated onto the top chamber. The transwell plates containing the cells were placed in an incubator and the cells were allowed to migrate for 6 hours (THP-1) or 18 hours (RAW264.7). The cells were then fixed with 4% PFA, stained with 0.5% toluidine blue in 4% PFA, counted using a microscope and analyzed. 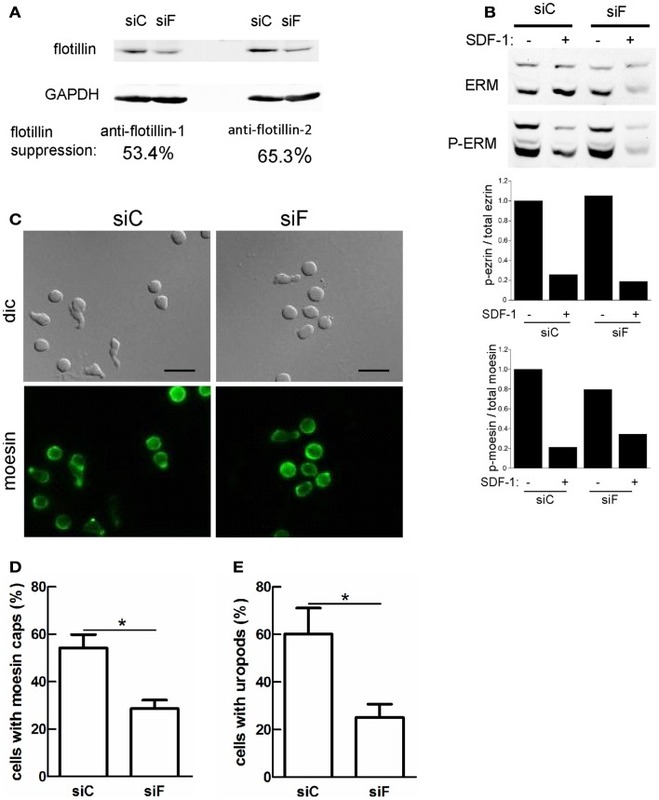 Reduction of flotillin-1 and -2 expression in murine T-lymphoblasts impairs moesin capping and uropod formation. Murine T-lymphoblasts prepared as in were untreated or treated with 10 nM SDF-1α for 15 min, and lysates were immunoblotted for total or P-ERM proteins. SDF-1α is elevated in wound fluid and increases tumor growth. 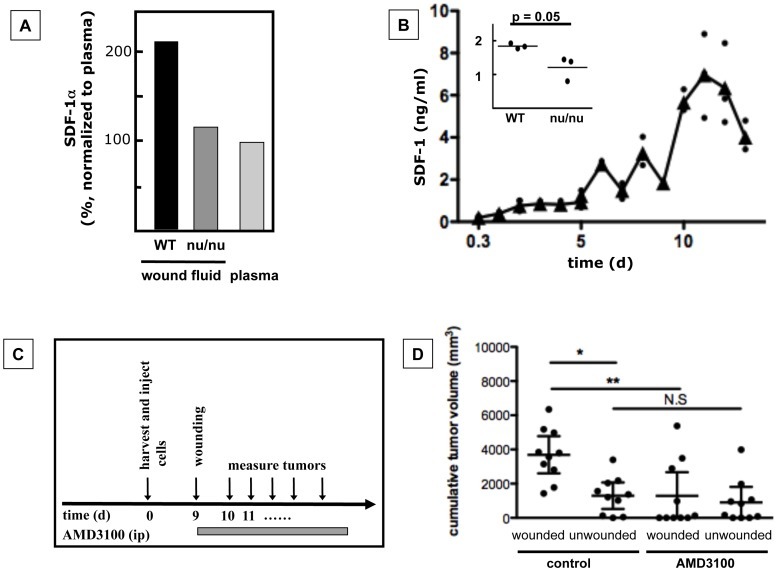 A. SDF-1α levels in wound fluid from BALB/c wildtype mice were higher than in wound fluid from BALB/c nu/nu mice (nu/nu) or plasma from BALB/c WT animals (cytokine microarray).